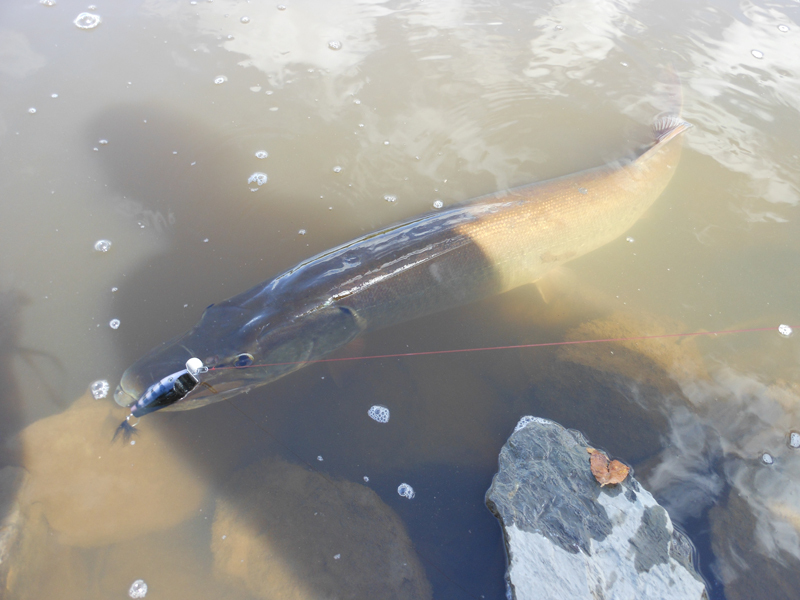 While the striped bass, bluefish and bonito's are starting to take all the headlines in the northeast world of fishing, there are some other species that are starting to wake up with the cooler water temperatures as well. 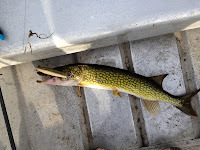 Pickerel, pike and musky! Watching these fish stalk and chase their prey is pretty awesome, and always plenty of fun to catch with top water baits. We jumped in our favorite multi-colored jon boat and set out for a stringer of pan fish, pickerels and large mouth. After dropping a decent large mouth on lil Barky, I finally connected a few larry's with lil Barky. The largest was just shy of 2 lbs. The fishing slowed down a bit and I grabbed a 1 1/4 oz Danny to see if they needed a bit more enticement. 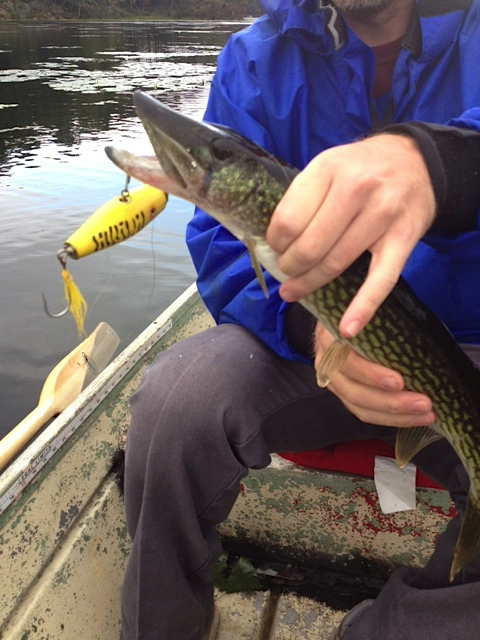 First cast, just on the point of some weeds, a pickerel annihilated it. Two casts later at another weed clump, the same. I think there was another bite or two on the danny. Then I broke out the proto big barky and had a few fish explode on it, but didn't find the hooks. Later that night, I got an email with some pictures. Pictures of some real fish...Musky! What a gorgeous fish that ate a 3" Pike. I was super excited to get this email, and could go on and on about how jealous I am, but I am going to let the picture do the talking instead. Congrats on a super fine catch! This past Saturday, I jumped in my jon boat and missed every large mouth I could, but did catch this pickerel on lil Barky. Thick enough that I had to put it on the scale. Not quite large enough to be a mongo, but at 2.6 lbs it was the probably the largest of the year for me. 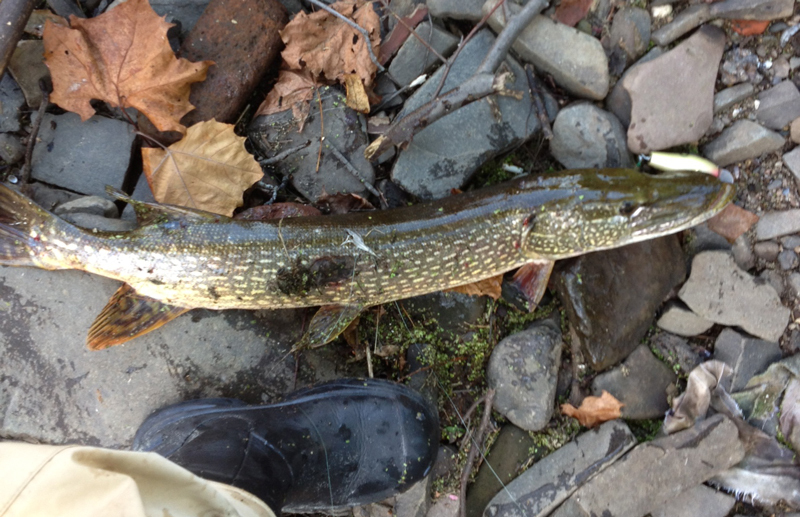 Then the following day, I get an email with a picture of this 33" pike that was caught on a frog 3" Pike. That frog has caught some serious fish the past few years. It might be ready to retire. I am not sure if I can convince the uber talented angler though.